Workplace discord does not come out of nowhere; there are almost always warning signs or small indicators preceding a crisis. By putting in place key prevention steps, you can ensure your staff is not only effective, but also successful in moving your company forward. Think of your clientele and their needs on a daily basis. You should be able to easily compile a list of potential trigger points for crises within your company. Foreshadowing potential issues gives you and your employees planning time so that when a crisis happens you can be proactive, not reactive. Are there any recurring problems you’ve noticed? Ask your team what they see in their day to day experience. Knowing what problems may arise is the first step in crisis management. After you’ve put a name to what specific areas may cause issues, create a plan and engage in employee training. Practice executing your plan with pretend scenarios to familiarize staff with standard crisis management procedures and get them in a problem-solver frame of mind. A plan is only as good as the action that follows. A crisis left untreated could affect many people in many different ways. Task one person to speak for your group in conflict resolution situations. This way everyone is on the same page and your client feels that they are being personally cared for in this moment. It’s important that whoever is having the issue knows that you are on their side and you take their dilemma as seriously as they do. At AdvantEdge, we use our company meetings and staff trainings throughout the year as opportunities to sit down with our team and brainstorm different ways we can better resolve any inefficiencies in our services. When our client succeeds, we succeed. Our staff of Client Service Coordinators are trained and prepared to handle a wide array of situations without skipping a beat. 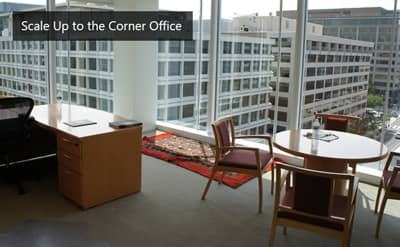 With this you can be sure we are also prepared to help your business with whatever workspace concerns surface. Bottom line is that when a crisis arises, it’s important to get the right people involved and act swiftly. Be proactive with your approach and stay in tune to your clients and their needs. 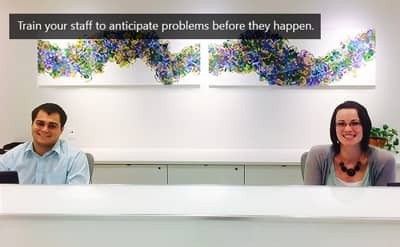 Stay connected to your team to plan ahead so that each employee has the skills and know how to handle difficult situations. While effectiveness comes with experience, rather than waiting until a problem arises, work defensively by considering potential future issues. 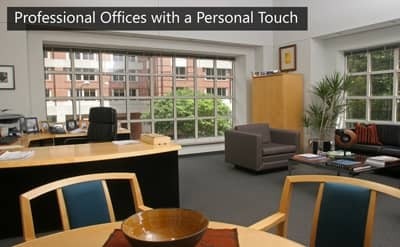 To learn more about how we can help your business by taking care of office space and services click the button below.